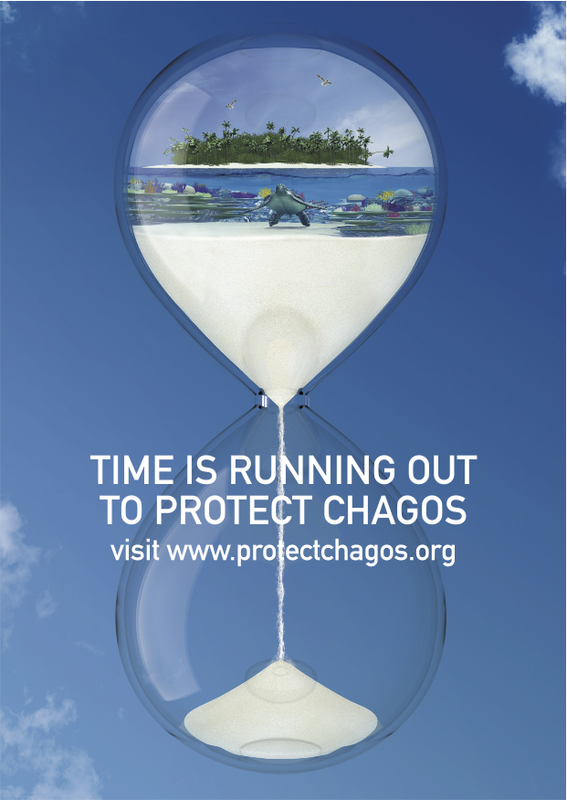 The Chagos Islands lie in the middle of the Indian Ocean – the world’s largest coral atoll made up of 55 tiny islands in quarter of a million square miles of the world’s cleanest seas. The official name for the islands is the British Indian Ocean Territory, and they have belonged to Britain since the Treaty of Paris in 1814. The only inhabited island is Diego Garcia, which is home to a military base. The waters around the islands are exceptionally clean and the coral reefs have not, so far, been significantly damaged by human pollution or climate change. A survey in 1996 concluded that the waters around the archipelago were the cleanest anywhere in the world. I was asked to help create marketing literature in support of a campaign to protect and preserve this pristine natural environment. An easy campaign to back, you might think. But the pristine environment had been preserved at a human cost: in the 1970s all the inhabitants of the islands had been removed by the British Government, when the military base was created on Diego Garcia. These weren’t truly indigenous peoples – they had been there for around half a century, no more. All the same, they called in home, and many of them want to go back. Sovereignty of the archipelago is also disputed between Britain and Mauritius. All of this meant that the campaign needed to make its points effectively and strongly but with sensitivity to the controversies surrounding the history of Chagos. 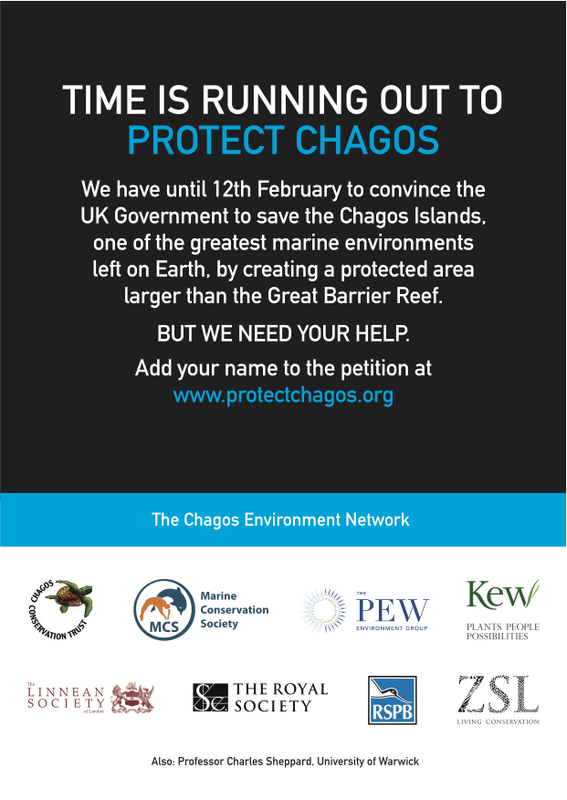 The literature was designed with a specific aim: to get people to sign a petition to persuade the UK government to create a conservation area around the Chagos Archipelago. I was asked to help a team of designers to create a concept that would capture the public’s attention and imagination. It needed to be simple, effective, with a strong sense of urgency. The campaign needed people to take action now. There was something positive they could do, that would make a real difference. 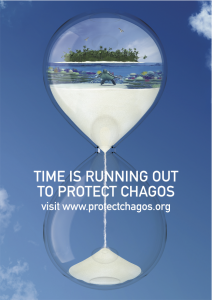 The hourglass with the sand running through suited the image of Chagos, while also stressing the need to act fast. The text and visuals were designed to work together to get across a simple message and call to action. 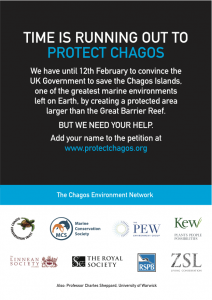 On 1 April 2010, the British government established the Chagos Archipelago as the world’s largest marine reserve. At 640,000 km2, it is larger than the country of France or the state of California. It doubled the total area of environmental no take zones worldwide.